You don’t need us to convince you that sitting at your desk for hours a day can be detrimental to your health. Being sedentary is an obvious health hazard (a recent series of studies says it’s just as bad for you as smoking), but unfortunately, most office jobs don’t allow you to spontaneously get up to do 10 burpees at your desk — at least, not without garnering some weird looks from your coworkers. Thankfully, there are some decidedly less embarrassing steps you can take to avoid gaining weight while working a desk job. The link between stress and weight gain is well documented. 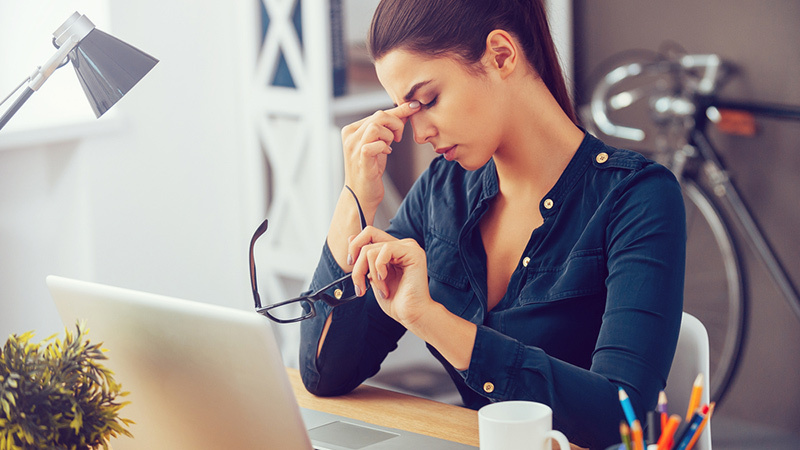 We will inevitably experience bouts of stress at the workplace, but thankfully, there are several ways to reduce daily stress. Aside from getting active (more on that later), a recent study though from Social Psychological and Personality Science found that talking about work stress with a co-worker can help negate the negative effects of stress. If work is stressing you out, take some time to chat about your concerns with a colleague. They may be able to offer some advice, but even just confiding in someone else is proven to help reduce stress levels. Just be smart about who you choose to share with — steer clear of your boss’s boss, a co-worker with ulterior motives, or the office gossip, and always keep the conversation positive and clean. Standing desks are a growing trend at many forward-thinking offices. Long periods of sitting are not only associated with weight gain, but they also highly correlate with the storage of fat cells in the belly and liver. The BMJ Open journal reports that a higher ratio of standing versus sitting at the office is “associated with lower levels of total and liver adiposity [a.k.a., fat] and visceral/subcutaneous fat ratio.” Not good. The researchers also found that increasing steps at work (time to check your pedometre) also lowered total body fat storage. So what should you do? Research suggests that for every 20 minutes you sit, you should get up, walk around and stretch it out for two minutes. If you work with a laptop (and your office allows it), aim to spend an hour of the day working whilst standing up. Just because you’re working at a desk, doesn’t mean you have to be chained to it all day. 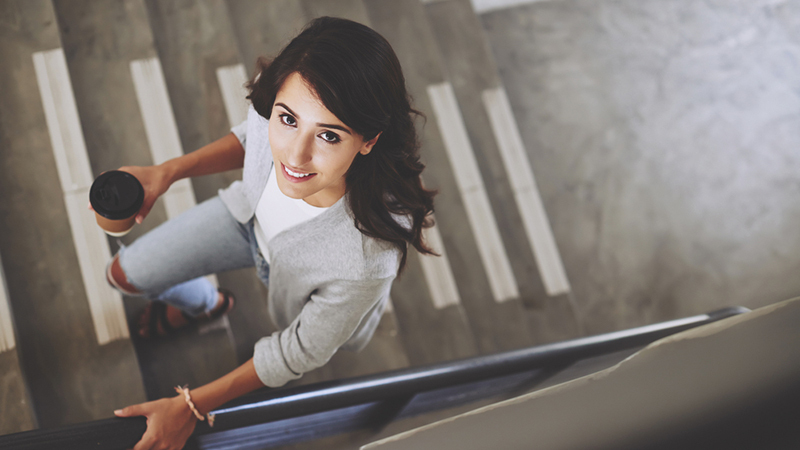 From taking the stairs and walking at lunch to even enjoying short breaks for mini-workouts, the are countless ways to get up and get moving throughout your work day. Not sure where to begin? Try our office workout cheat sheet for creative ways to stay active at the office. While it’s tempting and oh-so-easy to grab the latest lunch special at the cafeteria or local fast food joint, you’ll be doing your waistline (and wallet) a favour if you pack a lunch instead. 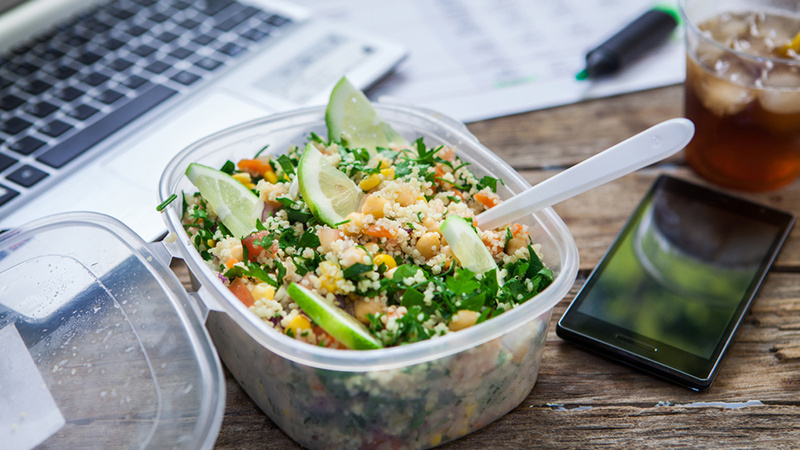 Bringing your own lunch to work means you’re completely in charge of the ingredients that fuel your body, helping you perform your best at the office and at the gym later, too. To a lot of people, brown-bagging sounds like a lot of work, especially during the hectic morning rush. Save yourself the unnecessary stress by preparing your lunch the night before. Set aside dinner’s leftovers for the next day, or build one of these healthier sandwiches for weight loss. Watching your carbs or following a paleo diet? Try a delicious salad jar or pack up a paleo chicken collard wrap. Yum! Don’t be caught unprepared when the 3 pm slump hits. Instead of grabbing a bag of chips from the vending machine, clear out your snack drawer and replace those junk foods with some healthy desk snacks. There are healthy, portable snack options available for virtually every type of craving. A piece of fruit, like an apple, with string cheese will help you get through the day. Other great options are homemade trail mix, nuts, cut vegetables with hummus dip, greek yoghurt, and even beef jerky, especially if you’ve got a workout scheduled. Do you feel the need for something sweet mid-afternoon? Consider treating yourself to some dark chocolate. A study from Nutrition Research and Practice found that when overweight and obese women snacked twice a day on a 1.45 oz dark chocolate square, they lost weight after 18 weeks compared to the control group. The women also had clinically significant improvements in blood pressure, glucose and insulin. An achy lower back can be a sign that you’re not moving enough at work or during after hours. According to a recent study from the International Journal of Occupational Medicine and Environmental Health, back pain is directly related to lower levels of physical activity (though sitting at a desk all day certainly can’t help). Get moving before the pain starts. “A moderate level of daily physical activity and preventing body weight and fat gain should be recommended in young desk-job workers in order to prevent and manage low back pain,” say researchers. Suffering from back pain? Don’t let it compound your outside-of-work fitness. Here are some exercises that can help. Remember, avoiding weight gain isn’t just just about what you do at the office — far from it. 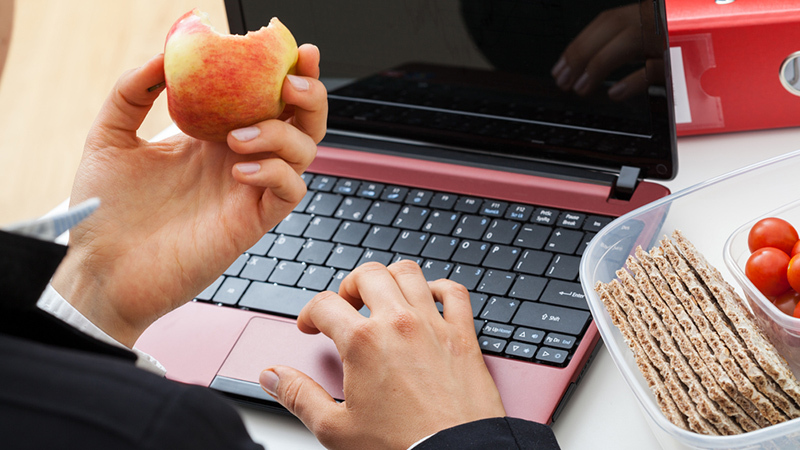 Maintaining a clean, healthy diet and regular physical activity after office hours will help mitigate the effects of a nine-to-five desk job and prevent weight gain.